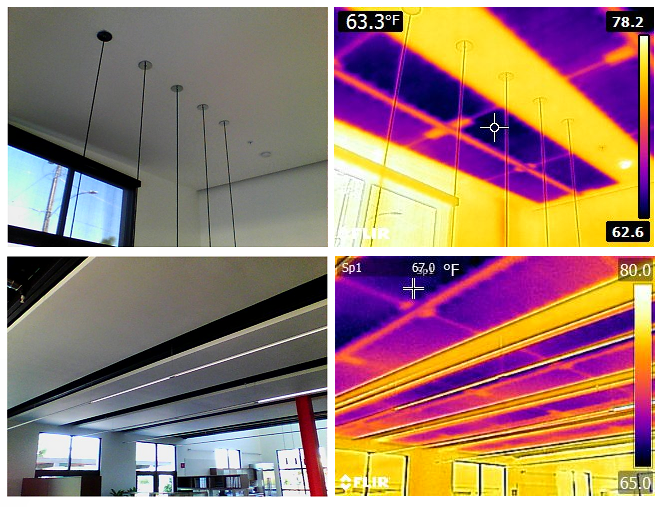 Start-Up of RayMagic Radiant Cooling system in the new passive office of Clarum Homes. The whole building (about 6,500sf) is powered by one 4 tons Daikin Altherma Monobloc (air to water heat pump). The Messana system also features a Neutral Temperature Dehumidification (NTD1200) and Heat Recovery Ventilation (HRV1200) to control the quality of air and its R.H. The air treatment system also offer free-cooling capability to cool down the building during the night. The building is divided in eleven radiant zones, and each zone features an independent temperature and humidity sensor (Messana Sense Magic). The open space area features a cloud ceiling with series of Ray Magic cooling panels. See picture on the bottom.